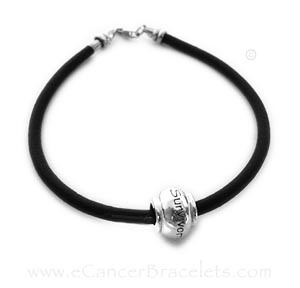 This SURVIVOR Bead Bracelet is on a black leather bracelet with a sterling silver clasp. The SURVIVOR bead is all .925 sterling silver. It has a large hole and is the European style/Pandora bead that will fit on a Pandora necklace or bracelet. It is approximately 10.8mm with approximately 3.7mm hole. *This is the only large hole bead I currently carry. The black leather cord is Greek Leather Cord with a .925 sterling silver clasp. Size: Measure your wrist and add 1/2". 7 1/2" 8" 8 1/2"